As I wrote earlier, summer makes it difficult to read a book, especially when one is busy with lots of outdoor activities and enjoying the sun, it is even more difficult when the book one is reading is going on and off the track every now and then, that is what happened to me with The Gods of Small Things. 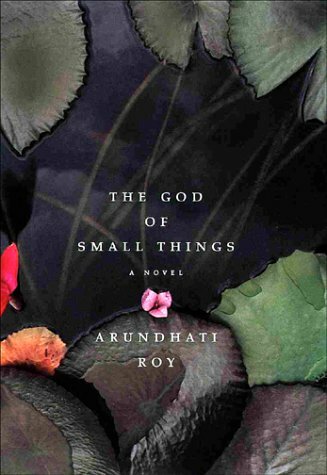 Amazingly to me, this novel won the 1997 Booker Prize, maybe there wasn't any very good book that year the Booker Prize was granted to Arundhati Roy. The storyline is really interesting, it tells the story of a family in India allegedly touchable with a hot tempered father and his family members that he batters from time to time. How death most especially, divorce, failed love, sexual abuse, political situation of their time and their relationship with another Indian family (untouchable allegedly) affected their lives, how it transformed them into what they become. All in all it is a sad story. This is a story if told in a clear chronological way and with one voice would have been more than interesting. From my point of view there is no main character, it talks about a lot of small things in a very extended way that dragged me back and forth that I lost track about where the story was really heading to, this book sent me to sleep many times in broad daylight due to the terrible boredom I felt. Many times especially in the middle of the novel I decided to abandon but I kept on for the sake of my reviews. It is not an easy read at all. Luckily for me I did not buy it, a middle school / high school library lent it to me. This is the second booker prize winner novel that I found tough to go through. This is a book sincerely I would not recommend. If you want to read about India and the separatism in their society, at least what this book was trying to transmit I would recommend The Space Between Us, 2006, by Thrity Umrigar **** . I am sure there are other great Indian writers out there. Though i read this book a long while ago, i remember having some problems with upon all the hype given it. Thanks for sharing your thoughts. Hey dear.. it's me Mary the blogger.. I have been away for a while.. still away though. Can't log in I am responding with my phone. Geosi I think you are not the only one.. I investigated a bit .. and I realised there are quite a good number of people who thoroughly dislike this book. It is an interesting story.. but I think writers should make their books readable. This book in most of its chapters was absolutely unreadable. I am glad now I know. And I see u too had issues. @geosi have you read the space between us by Thrity Umrigar? No, have not read that, Mary. Well the story seems interesting to me but Mary your major concern is the book lacking a major character but t seems full of real life stories and lots of lessons to be learnt. Might try and look for it but I guess not after the reviews lol. Kboy, that is one of my concerns. But my main concern is actually the way it took me back and forth in time. This is defnitely a book you will not enjoy except you love poetry, if not I will not recommend it at all. It is interesting that you downgraded Bride Price for the first portion being an easy read, but then also downgraded this book for being a more difficult read, i.e. not being chronological or featuring a "main character." Heaven help you should you delve into non-linear models of storytelling. Hi Afroboy, The Bride Price was in no way downgraded dear, not even for the first portion being an easy read. All Emcheta's books are easy reads that is one of the reasons why I love her books and proclaimed myself her fan so there is no way I would downgrade them for being easy reads. And yes, I downgraded The Gods of Small Things by Arundhati Roy, it is a difficult read, and in no way was it enjoyable. I believe writers should think about their readers when they write. Afroboy, I would advise you to read both books though and then leave a second opinion.